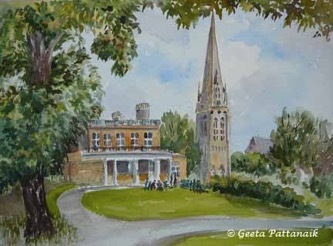 A while ago I painted St. Mary's Church in Hackney, London. 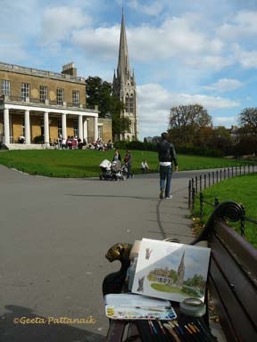 Here is the view I painted, and the painting as it was coming along on a very pleasant afternoon, when it was not raining. On the right is the finished painting. The clouds were there and it was not too hot. The structure is so elegant and the spires and the details of the church were not easy, but I love a challenge and just to quietly paint for a few hours is like meditation. One notices the people's movements, but the stillness of the backdrop makes it easy to focus. I did put a few people into the painting, close to the building. The tree in the painting is not shown in the photo, but it was something that framed the scene very well and was to the left of where the photo cuts off. The colors in the painting were accurate when I started, but by the time I was half done, as in the photo, the greens of the grass and trees looked darker, and the sun was closer to setting. In plein air painting, one fixes the time at a certain point, but one does not keep changing the lights and shadows as the time passes.